I’ve said it before, and I’ll say it again. In restaurants, it’s free to look at the buffet, but it’s not free to take and eat. The same with photos, images, videos (and gifs), etc. Photos are free to look at, but not free to take. There have been website owners, bloggers, and other such people being served with take-down notices, having their website hosting accounts closed, and social media accounts closed too, all because of image theft. Photos cost money, and they are expensive to make. Don’t believe me? Well, you could obtain a license for my photos via the Free Photos info page, which will give you free access to galleries of my work, but for a trade. People want their time paid for. You don’t go into your job to work for free. You surely don’t do overtime for free. You expect financial compensation. That is true for models, makeup artists, and me. The lowest price I can get a model for is about USD$25 per hour; many command modestly to a lot more than this. Each shoot requires a lot of preparation, and time before the first camera button is pushed. What is the difference between a model and having a friend pose for you for free? A lot. A friend working for free doesn’t know what to do with his or her hands. They typically only look at the camera, and expect magic to… magically happen. A professional model knows what to do with his or her hands, knows where to look, angles to put their shoulders. They know how to angle their heads. And that is just the posing. A professional model will always keep their skin moisturised, hairs and nails trimmed, and knows some basics about makeup art. There is a difference between the makeup ordinary people use, and the makeup a model would wear. Suitable makeup is not free. Also, in the heat of the moment, a professional remembers how to pose, and won’t go scatterbrained like beginning models (and photographers) would. The photo above was possible with a professional, still-life, gravure specialist model, and a makeup artist who can work quick, imaginatively, and can understand the context and make more of it. They know their stuff, and they know it well. Actually, I think I was the least talented one in the room. After the shoot there’s the image processing, storage, and marketing. Software is not free. Hard disc drives for photos are not free. Marketing is not free. Just these three aspects costs thousands of dollars. There are cheap ways to do these things, but none are free. Online image storage for commercial sales costs hundreds of dollars a year. Every few years I must replace my external hard drives, and they cost a few hundred dollars each. Some would say that an image that costs “hundreds of dollars” will sell many times, and so surely money will be made. Yes and no. Some images are more niche than others. Certainly the generic stock image will sell hundreds of times, and so the pricing is just a dollar or so. However, there have been confusing moments for consumers when two competing banks, by chance, used exactly the same $1 stock photos for their million dollar campaigns. The generic stock photos are clean and beautiful, but intentionally lack context so that they can be used for any purpose, thus increasing their sales potential. Rights managed photos, like mine, are usually specific to a context (typically Japan), and are as authentic as possible. The image above was one of the more expensive to make. In the photo you see three people, but you don’t see the other two out of view. There was the makeup artist keeping an eye on the models and holding the flash, and me. 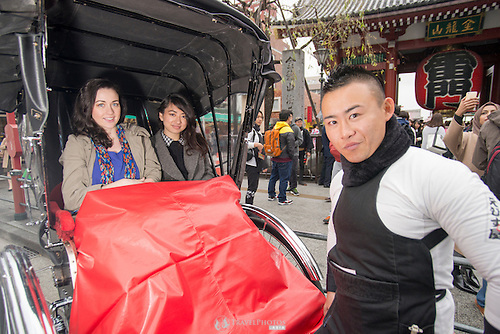 The rickshaw puller cost money, and it also cost me money in getting to Tokyo to begin with. This image is model released, of which there are three signed releases. Using photos you find on Flickr might be easy and… free, but they won’t have signed model releases, and so they cannot be used for advertising and other similar uses. CBS, among other news outlets, reported that a family sued an Australian mobile phone company for using a non-released creative commons photo of their daughter. The reason? It was extremely insulting, especially as it says in big bold letters “Dump your pen friend” and shows a gregarious Asian girl (see here). Regarding the specificity and context issues, image above is in an obvious touristy place, as you can see someone taking a selfie in the background, and a crowd in front of one the most photogenic, iconic attractions in Tokyo, Senso-ji Temple in Asakusa. These are the things that separate my image above from free and generic stock images; the sales potential is low, and the cost to set up high. Furthermore, my images can be set to exclusive use, so to prevent copycats and rivals from using the same images for their campaigns. There is a myth that it’s ok to use an image without paying for it, as long as you provide credit and links back to the owners. This is not true. I simply cannot go into McDonalds, take a burger, and then tell everyone “I ate this burger that I got from McDonalds”. It will still be called theft. 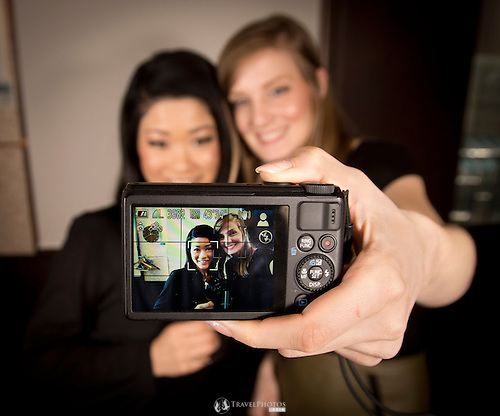 To use photos, especially when people are displayed in the photo, you need to have permission. Let’s say the photo above of the Vietnamese girl sitting on the balcony of a cafe in Saigon is used for a cafe advertising campaign; there’s little risk to her reputation and mine. However, if it was appropriated by an AIDS or mental health campaign, she risks huge ramifications in her community. There is a model whose career was destroyed by false claims of plastic surgery, as purported by an internet meme (see here). In short, photos are free to look at, but like a Da Vinci, Caravaggio, or Dali painting, you cannot take them home without paying… or you’d risk an international manhunt. I do have cheap alternatives for for bloggers, and other personal uses; there are many licensing options, just take a look at my PhotoShelter portfolio. At the end of the day, we all enjoy our work, but we all still need to be rewarded. Now’s perhaps the best time to announce this more publicly. Especially since the iStock community has finally realised that their business model is not sustainable; and here’s why.